I promise this post is not a tattle tale on my husband--I am guilty of the same behavior much more of the time, but I know our life is getting a little out of control when even temperate T is struggling with moderation. Tyler does not like fast food. He read a book (In Defense of Food--all about eating food in its most natural state--something you don't generally find at fast food), plus he's counting our pennies to apply to many, many med schools next Spring. So we don't do fast food. . . except when we're both getting out of class at 10 o'clock on a Friday night and we have to BACK at class at 8 am the next day. So we're at the drive through and in true Tyler fashion he picks the cheapest thing on the menu--I convince him that we should split a pumpkin smoothie and go for the 10 cent more burger with cheese-- I'm telling the lady over the intercom, 2 burgers, one small pumpkin smoothie, a glass of ice water. . .
Lady at Burgerville: Will that be all for you? S: And a large fry. It's Sunday night--we had a salad for dinner and it's about time to turn in for the night. Family phone calls are almost finished up, and T's in the kitchen. 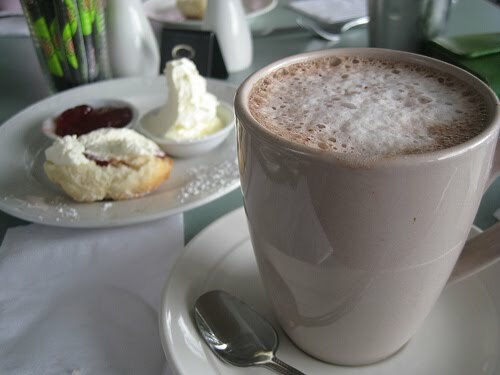 T: I've decided to make homemade hot chocolate and scones-- I need a sweet treat. Absolutely we need a sweet treat. No complaints by me. Technically, I guess this still might be considered moderation for a few reasons. First, Burgerville prides itself on only using the freshest ingredients, all from local farms (though I'm pretty sure it was a white flour bun). Secondly, the scones had whole wheat flour. Thirdly, if I'm writing about these experiences as anomalies, it's not the norm. Right? 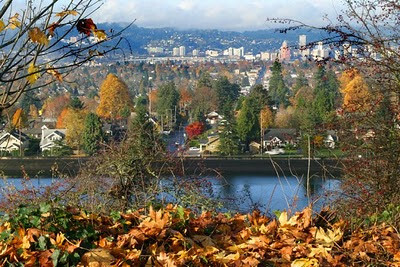 This is Portland in autumn--blessed, blessed Portland. I admit that it still takes a bit to get me out jogging 3-5 times per week, but how I love the sunshine and crisp air when I start out, breaking into a rhythm with my ipod as my feet almost magically spin in circles, carting my body onward, ever onward. I loved jogging in Botswana more than any other time in my life, including now, but this day brought me back to those blessed days, too. Confession: I generally end my runs with David Archuletta's "Touch My Hand"--if you know the song, it's cheeseball, but one time my cousin Kayleen told me the song reminded her of me and T, and since then, I just picture scenes from our lives together as I do that last little push to the finish. Today I decided to climb one more hill after David's song ended. "Joy to the World" started playing--I laughed to myself and thought I should just turn it off, Christmas is still two months away :) But I was jogging uphill--I didn't want to stop to fiddle with my ipod--and then the clear, forceful, redeeming words rested on me as I fought my good fight-- "and wonders of His love", repeating again and again. I stopped jogging and started dancing. I promise I've not lost all of my senses (yet) but I also promise that I must have been a dancer before this life--when I feel the greatest bouts of joy, I just dance. My sister Lacey might remember me jumping/dancing around our living room a time or two, but for the most part, this is a private affair, me praising the Lord with dance. I hope I can keep this feeling in my heart today, my sometimes sad and sometimes lonely and sometimes selfish and sometimes hardened and self-pitying heart--the wonders of His love.